I am doing something completely different this month. Rather than choose one designer I have chosen one publication which feautures many designers. 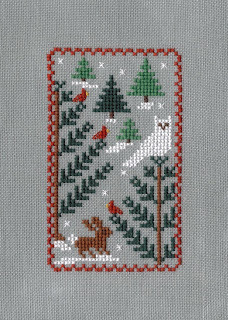 The Just Cross Stitch Annual Christmas Ornament Special. I first heard about this publication when I was new to blogging and discovered the American way of doing things! I loved the idea of an entire magazine dedicated to Christmas and to Hallowe'en too. I now have 2012-2015 as paper copies and all the previous ones on the CDs they do. 2. 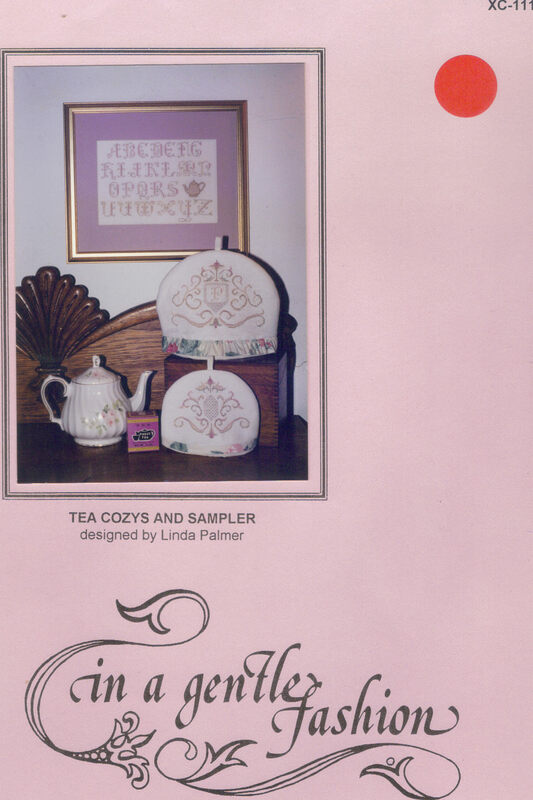 Have you stitched a project from this publication before? Yes, the magazines are an amazing source of designs and a great way to discover new designers. The first year I knew hardly any of their names but now I can look at the pictures and identify most of the designers by sight. 3. 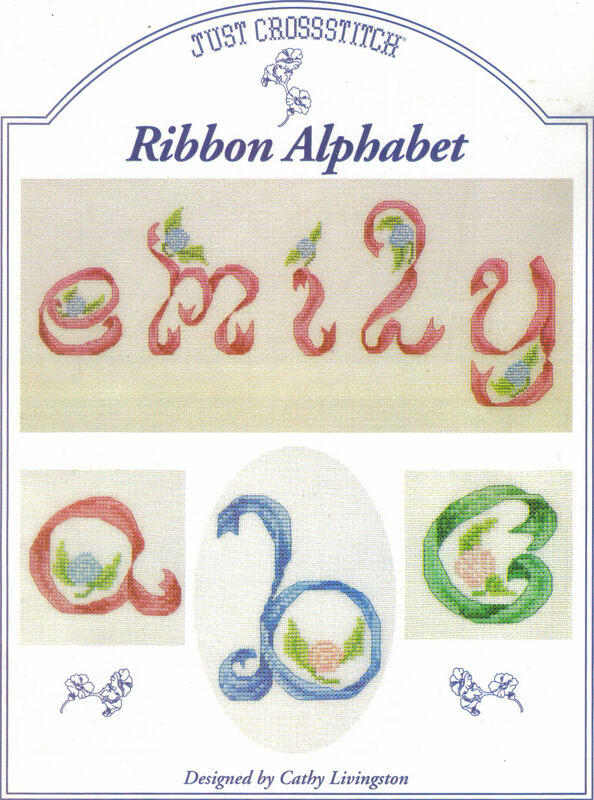 Would you buy/stitch a design from this publication again? Why/Why not? Yes, I have a subscription! 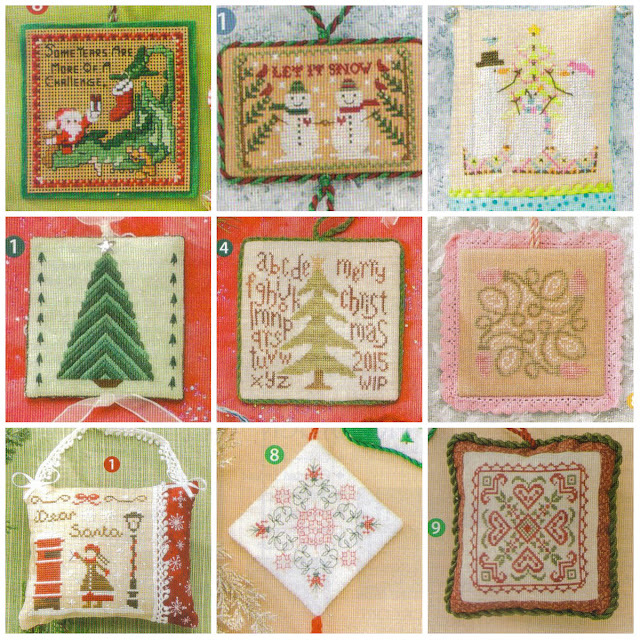 I'm going to be taking part in Kaye's Christmas Ornie Blog all next year which is a great opportunity to stitch some of the wonderful designs from the magazines. 4. What made you choose these particular designs for your Top Ten ? Every year I go through the magazine and write my favourites on a piece of paper which I leave in the front of the magazine to refer to later. Then I think "oh yes, I still love that one" or "what was I thinking that year?" 6 - Big fan of Ink Circles. Not such a big fan of tangled up lights! 8 and 9 - Two nice abstract ornies which I think will look lovely stitched in the same colours on a high count fabric. Maybe add some beads. 10 - Brooke's Book's Angel (see below). 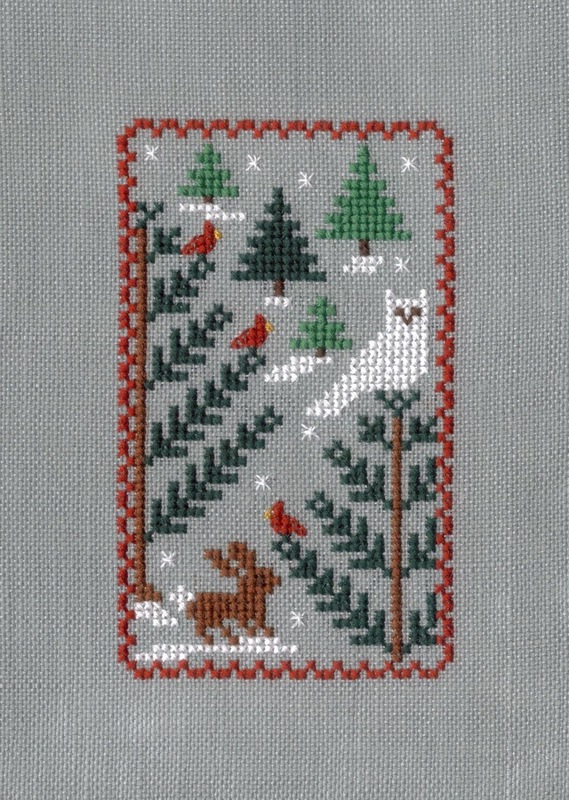 I will probably never stitch this but it's gorgeous and so different. I love it! 5. Did you notice anything that distinguished this issue from others? I have to be honest, I felt there was a lot of repetition this year. A series is nice (see number 2) but mamy of the designs had a feeling of deja-vu about them. The Ink Circles one is fun but was there a similar one in a previous year? I also think there was a problem with the printing this year. Everything looks very washed out. Look at the SamSarah design. Surely that will be more vibrant in real life? It made choosing the designs quite difficult, I looked at the charts and descriptions more than usual. So what were your favourites this year? If you've done a review leave a link in the comments so we can all pop over and read it. 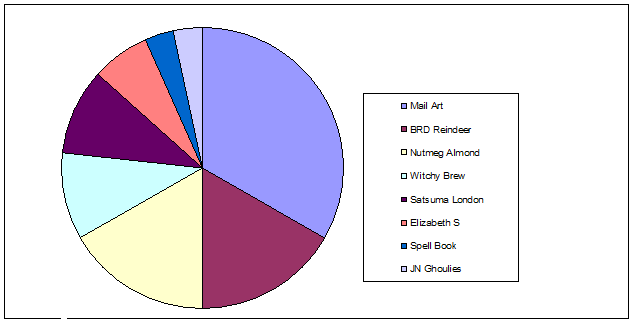 Finally, a pie chart for September, a complete reverse of last month. With fewer projects and more time spent on each one. Over the last month I have only stitched 1 of my 15 designs but I did finish it! This was such a fun project to stitch and make up. 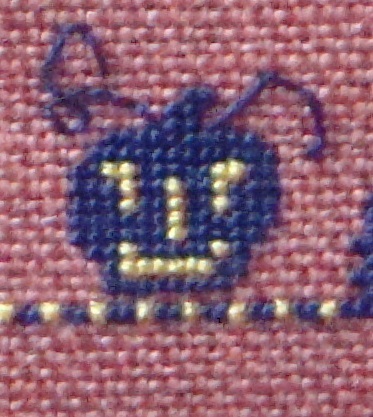 It is very tiny but there is a lot of detail in there. I also used a curved needle for the first time. A John James curved tapestry size 24 for those who were wondering. I've been stitching the top left hand corner this month. And also, her name. You can see I have almost completed the border for this side of the design. Then I can move on to some colours! Mostly grey and orange. Maybe a finish by the end of this year? 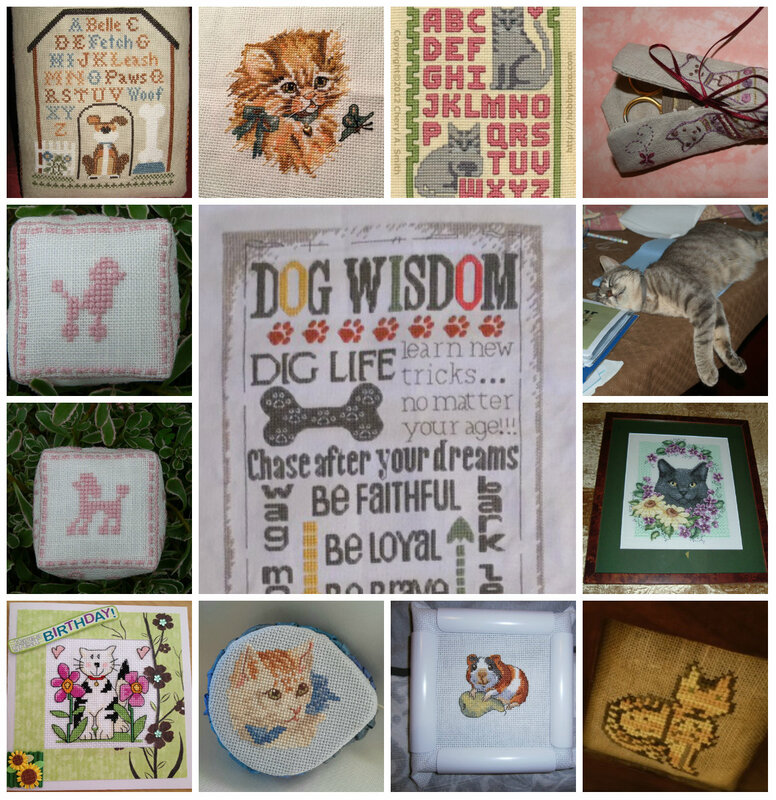 September – Where do you buy most of your stitching supplies? I would love to say "a sweet little LNS run by an enthusiastic mother and daughter team along with a shop assistant who shares a Birthday with the Large Boy and was happy to chat to him while I shopped in their well-stocked Aladdin's Cave of charts, fabrics and exotic threads and accessories". But Hobbycraft opened a warehouse store and killed Helen's business. So now I shop online. In common with 99.9% of UK stitchers I use SewandSo as my starting point. They have the widest choice, most things are in stock and their delivery is next day at very reasonable prices. 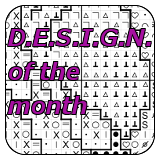 The website is easy to browse, except for the "Other Designers" category where there are all sorts of hidden delights. If anything, there is too much choice and you can get overwhelmed by it all! SewandSo are run by enthusiasts. If you email or call them they know what you are talking about so I feel it is as much like an LNS as it can be. It's certainly better than the aforementioned warehouse stores. 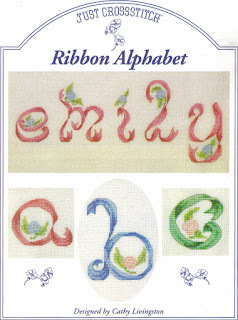 Willow Fabrics is a family run business based in Cheshire. They stock many kits and charts but their website is my number one choice for plain fabrics of all colours and counts. Many of the more unusual colours you have admired on my blog (eg 32 count Cognac linen) come from Willow Fabric. Their sales are second to none too. Which is why I have entire metres of some obscure colours because they were too good to miss! Hand-dyed fabrics is an evergrowing market and I have two firm favourites. Dawn and Kate. Or Crafty Kitten and Sparklies as they are known on the internet. Both are one-woman businesses run by amazing enthusiast expert enablers! I feel very torn between the two businesses so I have devised a cunning strategy to help me decide where to shop. Dawn's fabrics are slightly more muted and subtle, possibly because I usually order 32 count Murano which doesn't dye as brightly as the linens. Kate's fabrics tend to the wilder side of life! So that's how I choose. Muted = Dawn, Lively = Kate. "A beautiful blend of greens and golds, like sunlight streaming across a grassy landscape or slanting through a forest canopy." and named after part of my address because I inspired this fabric. I also shop online for charms from Ang's Attic and for scrapbook papers and embellishments from Scrapping the Magic and Papermaze. All three are small, family run businesses who deserve to be supported. In real life I have a local craft shop which sells alot of scrapbook papers and embellishments too but they cater mostly for the card-making people rather than cross stitchers. Hallowe'en isn't really a thing for them! Finally, Hallowe'en is fast approaching so it must be time to launch the Hallowe'en Trick or Treat Blog Hop. Regular followers will know the format. Leave a comment here saying you would like to take part in the hop as a Picture Poster. When I have everyone signed up I will choose a Mystery Phrase and allocate each Picture Poster a letter of the alphabet. 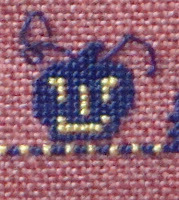 On 31st October they must make a blog post showing their letter and a photo of something they have stitched on a Hallowe'en theme. On my blog there will be a list of all the contributors so people can hop around and collect the letters to work out the Mystery Phrase. You don't have to be a Picture Poster to collect the letters and join in with the competition but all Picture Posters do get an extra entry in the competition. I've done quite a bit of stitching this week but I can't show the piece because it is for an exchange. How frustrating! Maybe just a little peek? 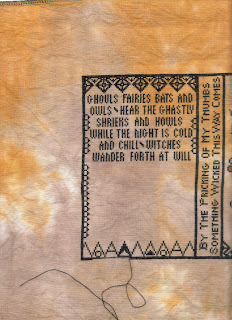 This is the second design I've stitched from this series of four by Blue Ribbon Designs. I changed the fabric to a 32 count Twilight Blue linen and the white to B5200 because it really pops against the blue fabric. I love the bright red of the cardinals. Before I discoved blogging I did not realise these birds were actually that bright in real life! I thought it was a little artistic license on the designers' part. So you can see it was a great month! In fact the whole of last month was a real zero personal spend. I had to get the Large Boy a new pair of shoes and a new pair of trainers for school (sports shoes for the foreign!) so all I spent on myself was £3.20 for some curved needles. But never fear, I did not go without this month because it was my Birthday and my friends are ever generous! Here are the presents I received in addition to a lovely Crafty Kitten voucher from the equally lovely Crafty Princess, stunner! From Jocondine, a beautiful hand made card and packaging for the ribbon which came in a vintage box. It might even be vintage ribbon. see, it has my initials on it! 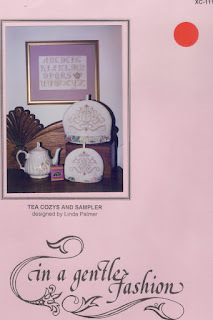 From Nicola the Everlasting Diary featuring a number of samplers from the Fellers' Collection plus the gorgeous Needlelace cards from Catherine Barley. I fell in love with the Snow Queen cards, there is a wondeful video of how they were made on her website here. From Mouse, two Just Nan charts which I didn't have and some lovely ribbons. There seems to be a conspiracy to get me to use more ribbon! It has been IHSW this weekend so I've been working away on Elizabeth Shephard or Lizabeth Shephard because I haven't done the first E yet. I stitched most of her name and the brown motif in the top left hand corner. stitched on 28 count tan evenweave. And now over to you - Here is the place for you to link up so we can see what Gifted Gorgeousness you have been stitching so far this year. Please use your name or your blog name in the field NOT the words "September Update" so I can easily see who has linked up this month. And link to the actual post, not just your blog. People are still getting this wrong! It is easier if you copy and paste the link, rather than typing freehand. Finally, let's have a little Giveaway to celebrate my Birthday in two days time! Followers of The Alphabet Club will know how much I enjoy stitching lettering and alphabets. So here are two charts featuring alphabets. Once you have linked up with your GG post just leave a comment letting me know which chart you would like to win. Which is going to be the ornie for the Christmas Ornie SAL Blog. This month's theme is Trees and/or Presents. I have chosen a design with trees in it although not indoor decorated trees as many people will probably chose. Thank you for all the lovely comments on my little Nutmeg Company Cottage, which you can also see in the TUSAL photo. I am slowly replying to all the comments! Several people asked about the curved needles. The one I used was a John James size 24 curved tapestry needle so specifically designed for this sort of thing rather than for stitching upholstery. The charts are available as part of a kit from the Nutmeg Company's website. I would really recommend getting the whole kit, they are not that expensive and include the plastic templates which will really help with the making-up of the cottage. 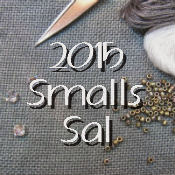 They also include the long bugle beads and the higher count fabric. Which is useful if you don't use much 18/36 count normally. Finally, the Summer Postcard Hop is over so I will be launching the Hallowe'en Trick or Treat Hop soon. Have a look at last year's to see how it all works and to be ready for the sign-ups this year! I'll see you all on the 15th for a pre-Birthday Gifted Gorgeousness post. My Blog Comments email folder has gone over 100 emails to answers, my Reader had 200 posts to read (got that down to 140 now), it took all week to stitch an ornie I could have done in one day and I'm feeling a little "peopled-out" having done two days at work, one parent support group, two friends visits and a Toddler Group too. I need to hermit this weekend! I chose the themes for the Hallowe'en Ornie SAL blog back in November last year so they tend to come as a surprise to me by this time of year! I wasn't sure I would easily be able to find something for this month's theme"Spooky Words" but as I looked through my issues of JCS I realised there were loads of designs I liked! Which is probably why I chose this as one of the themes in the first place. I found a nice design which said Hubble Bubble Toil and Trouble which reminded me of another chart I owned. When I found that one it was too large for an ornie but in with it was this one which was the perfect size stitched over one. I do love my over one stitching. 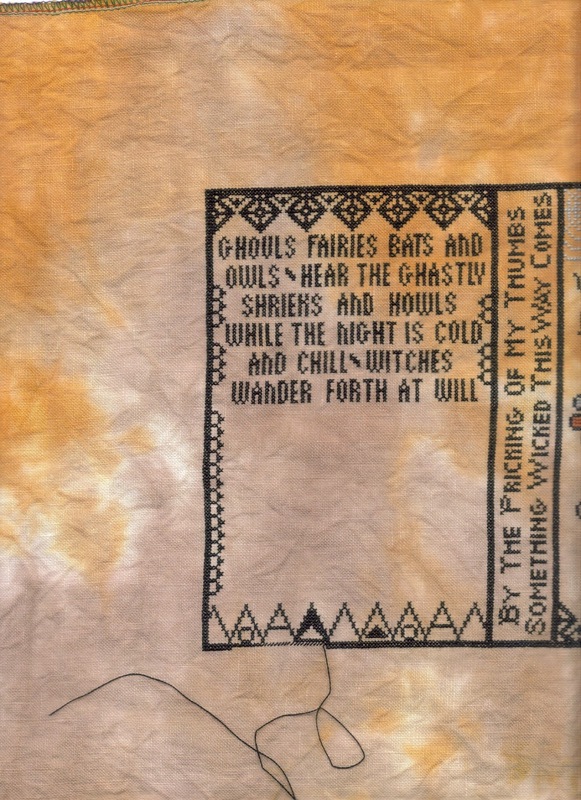 This is the debut design from 2009 by Tammy who has a blog called Witchy Stitches. It's not easy to see if she has many other designs because there's no page for her own stuff. But there is a sweet Wynter Witch. 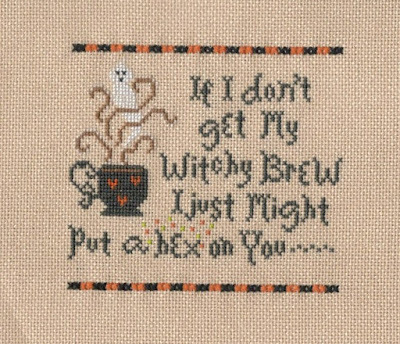 Anyway, I stitched this one using the recommended DMC conversion except for the lettering and mug which I subbed 3799 for plain black. I thought it was closer to the Gentle Art thread the model stitcher used. Because I stitched the design over one I was able to cheat on the border and stitch it over two which saved so much time hahaha. I also added some little starry stitches around the word "hex" just because I wanted to. I'm not sure whether to scrapbook this with the others or frame it and put it next to the kettle to drop a hint to my family! I managed to put a few stitches into Satsuma Street's Pretty Little London for my Tuesday SAL with Linda and Kate. White, cream and dark blue added. 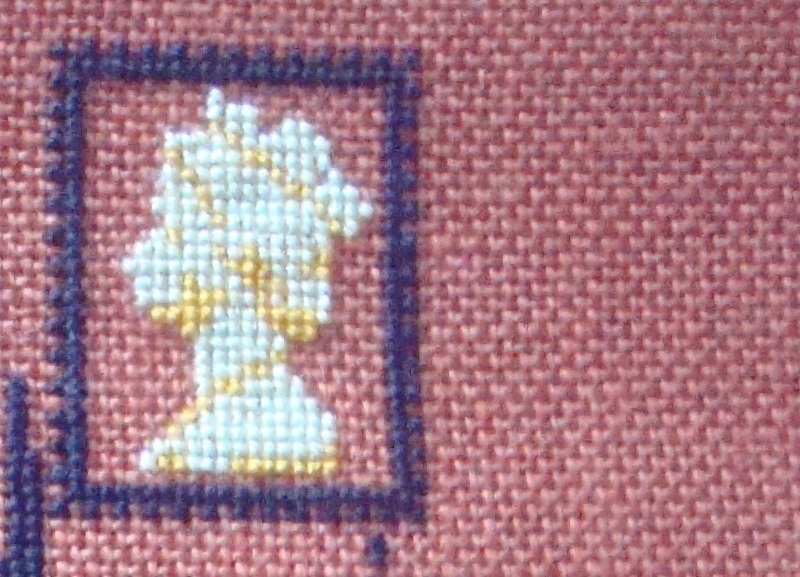 stitched on 40 count Jewel Butterbeer linen in need of an iron! Final card from Leonore to me! 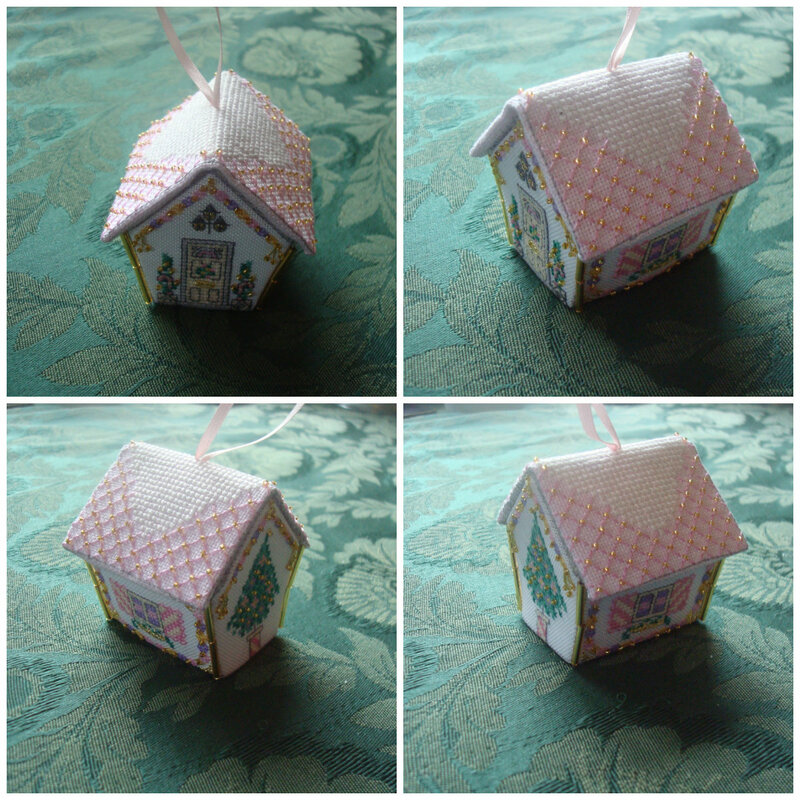 The roof is stitched on 28 count pink evenweave and the walls are stitched on 36 count white evenweave. The beads are all Mill Hill gold petites. Sewing the four walls together. 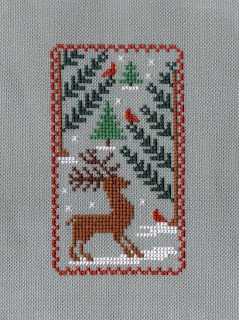 This was quite simple, I just whipstitched through the back stitched outlines. I knew the roof would be tricky because it overhangs the walls rather than fitting flush. Curved needles are epic! They make things like this so much easier, with a straight needle I was getting it stuck on the beads and in the fabric. Once I'd finished the false roof I attempted to fix the real roof using double sided tape. Unfortunately it started to lift away at the edges. Because the roof is one piece it wants to lie flat rather than be bent in the middle. So I had to stitch it in place after all. However, having the false roof to hold it in place made this much easier so I would use this technique again. Now who would live in a house like this?